Is your kid full of mischief, constantly getting into minor--and sometimes major--bits of trouble all around town? Does he always have a really funny quip or witty line of snark? Don’t have a cow; we’re not saying we can totally relate, but we think have a way to help. This Kids Deluxe Bart Simpson Costume, obviously! You can get him this outfit and let him feel right at home dressed up as the original bad boy of cartoon comedy. Oh, did you think we meant we would help him become less troublesome? Of course we would never advocate that! Think of all the brilliant hijinks the world would miss out on without Bart Simpson; nobody would antagonize the entire country of Australia, release a whole bunch of snakes on the town, or become some sort of daredevil-prankster, a la Evel Knievel. 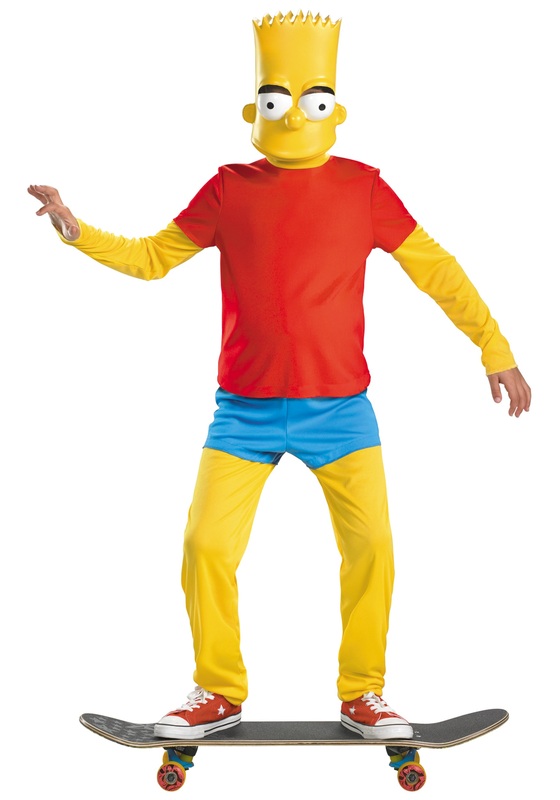 With this Bart costume, your little guy can easily become the ultimate kid-sized troublemaker. Don’t worry. Bart never does any really bad; everything is in good fun in the end. With this jumpsuit, your kid will be styled in the iconic red and blue shorts of the oldest Simpson child. Yellow sleeves imitate Bart’s body, and the outfit can fasten a small pillow around the waist with velcro, for the oh-so-desirable pot-belly look. Also included is a yellow molded-plastic mask showing Bart’s perpetually bored face. The only thing missing to start a true streak of mischief is a skateboard -- but we’re sure your little fella has already got one handy!